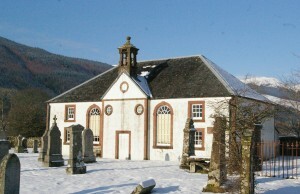 The parish church of Glendaruel is also traditionally called Kilmodan. The name is Gaelic, ‘the church of Saint Modan’. It is situated in the lower reach of the long glen that stretches north from Loch Riddon to the pass called Caol Ghleann (‘narrow glen’) on the road that ultimately brings the traveller to the shore of Loch Fyne. 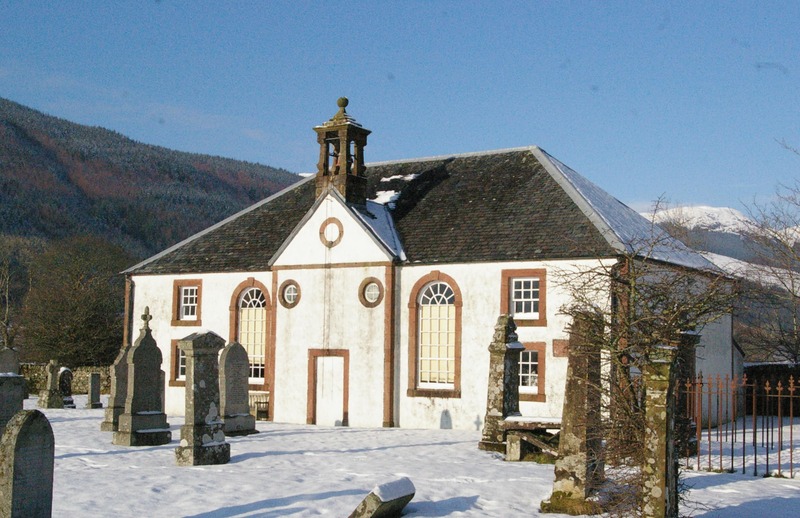 Sited on a beautiful meadow on a bend in the River Ruel, the present church was built in 1783 on the site of a seventeenth-century church built by Sir Dugald Campbell of Auchenbreck. A plaque commemorating him is embedded in the wall of the church. That church had itself been built on on the site of the medieval church of Kilmodan. Nothing remains of the medieval buildinng, but a fine collection of nine medieval carved stones can be found in a little building in the SW corner of the lovely churchyard. Some of these were created by stone-carvers from the ‘Loch Awe school’ – itinerant craftsmen who made such work all over Argyll – in the fourteenth and fifteenth centuries. 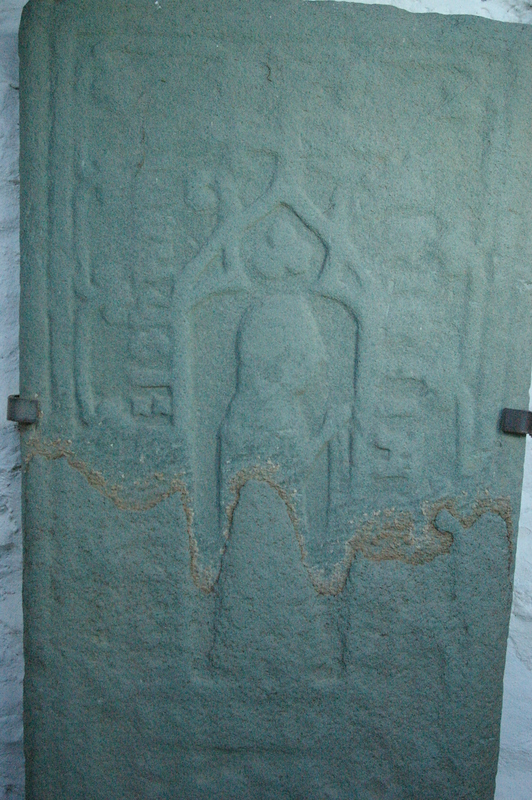 One of the stones commemorates ‘… daughter of John …’ (her own name has been worn away). She is shown at prayer, telling her beads. The church predates even these stones, however. It is recorded as early as the mid-thirteenth century, and it probably has its origin some centuries earlier than that. 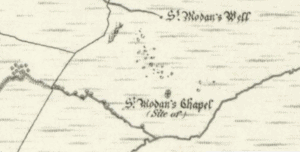 On the hillside above, to the east, there is a St Modan’s Well (NS002844). It was marked on the OS map a century and a half ago, but at some point in the succeeding decades knowledge of it was lost, and it disappeared from the maps. It was further obscured by commercial forestry operations on the surrounding hillside, and changes to surface drainage were thought to have destroyed it by the 1970s. But Faith In Cowal, with some willing volunteers, rediscovered it in the summer of 2015. Read about the search for it here. Some pieces of quartz, a bright white hard stone, were found in it. 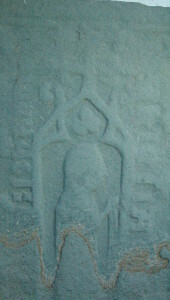 These stones were often used as a simple offering or gesture of prayer at holy wells – also in graves. Their presence here may indicate the use of this well as a place of prayer or pilgrimage in the past. 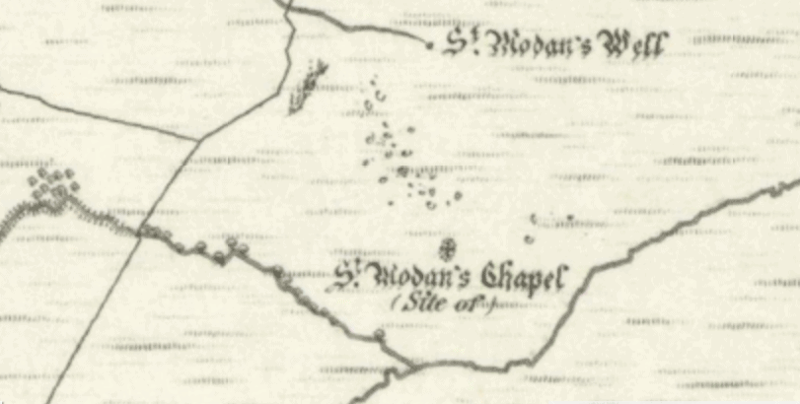 Now that the spring has been found it is hoped to make something of the site, to help pilgrims to find their way there from Kilmodan church. It is a walk of less than an hour – if you know where you are going. Getting there: for a good OS Map of Kilmodan and area, with roads, click on ‘View Larger Map’ below.